This is the first summer in a very long time where I’ve had to step away from the soup ladle. You see, I generally eat soup for lunch all year ’round. It’s a food I never really get tired of, since there’s so many varieties. My grocery store always tempts me with a variety of homemade soups, but I’ll often whip up a big batch of my own, too. But this summer has been strange in Michigan. It hasn’t been hot, but it’s been humid. And sitting around my house, sweating for no reason other than the suffocating amount of moisture in the air, does not put me in the mood for hot soup. So I’ve decided to take many of the elements of one of my favorite soups and turn them into a cold salad that will keep me cool. Today, I’m partnering with The Beef Checkoff today to bring you guys this great Mini Meatball Minestrone Salad recipe. Not only is lean beef easy to prepare and delicious, but it contains ten essential nutrients that your body will appreciate, like iron, zinc and protein. With so many different cuts of beef to choose from, it’s simple to create a healthy meal the whole family can enjoy. 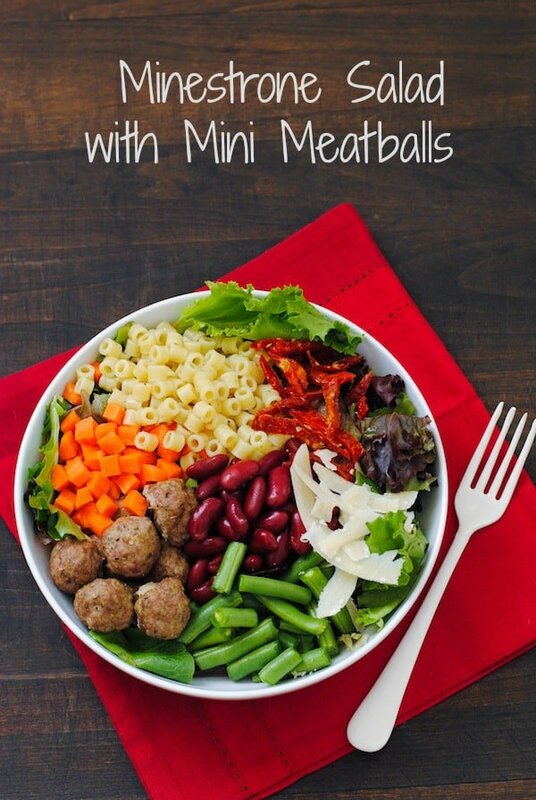 When I started coming up with the idea of a minestrone salad, mini meatballs popped into my head right away. This recipe would also be great with thinly sliced steak, but aren’t mini meatballs more fun? They make me laugh for some reason. And laughing while eating a cold salad is better than sweating while eating hot soup, right? For more tasty recipes celebrating beef, make sure you follow the Beef – Let’s Celebrate Pinterest Board. You can also find The Beef Checkoff on Twitter, Facebook and Pinterest. Make the Mini Meatballs: Preheat oven to 400 degrees F. In medium bowl, mix beef, egg, breadcrumbs, oregano, basil, garlic powder, salt and pepper until well combined. Form into 1-inch meatballs and place on parchment-lined rimmed baking pan. Bake 8 to 10 minutes or until internal temperature reaches 145 degrees F.
Meanwhile, cook pasta according to package directions. Drain, rinse with cold water, and drain again. Transfer to medium bowl and toss with 1/4 cup salad dressing. 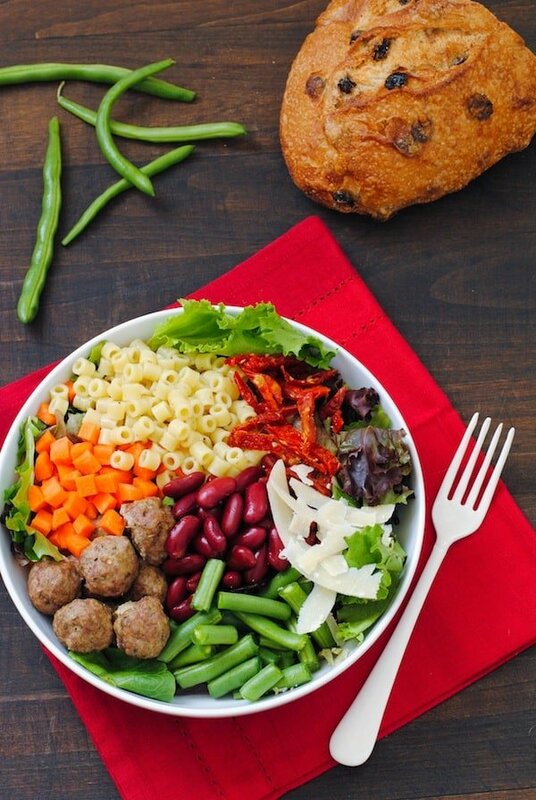 Divide mixed greens between four plates or bowls; top with carrots, green beans, kidney beans, sundried tomatoes, cheese, meatballs and pasta. 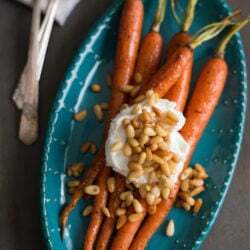 Serve with additional salad dressing. This post is sponsored by The Beef Checkoff. All opinions are my own. Sponsored posts help me pay for the costs associated with this blog (groceries…lots of groceries), and help support me as I pursue a career in recipe development and food photography. Oh goodness what a salad. So beautiful and tasty too. I’ve never thought to put meatballs on a salad either. Great idea!! What’s funny is that meatballs on a salad didn’t seem strange to me at all when I was making this, but then everybody told me they had never seen it before. And you know what? I guess I’ve never seen it before, either. It *is* a little crazy! haha. I LOVE this idea Lori! You have all the best stuff in there! I’m going through my recipes to try soups as salads! After how pleased I was with this one, I’ve been thinking about other soup-to-salad ideas too, Cindy! So far, I think Chicken Noodle would work really well. I’m sure there’s others. What a creative way to make a salad! This is great Lori!!! What a fabulous idea. I love how you can just make anything into a salad! I think you pretty much can! Thanks Tammi! Very creative spin on the minestrone and I love the colors! BTW, do you like to keep your salad components “compartmentalized” or do you just go ahead and mix it up? I’m definitely a compartmentalized salad eater. It must be the last hold over from when my food couldn’t touch as a kid or something. But also, I like to stab each element with my fork so that I know every bite is AWESOME. haha. Thanks so much, Dorothy! We couldn’t have a #SS about beef without at least a few of us bringing meatballs! I can not begin to tell you how much I love this salad! So creative and I am so excited to try making it. Thanks so much, Isabel! Enjoy! 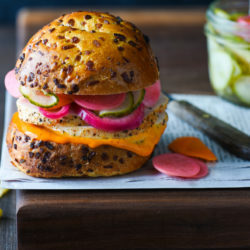 This recipe is so stinkin’ creative. Love it! This is such a great idea Lori! It has been getting ridiculously humid this week. Not exactly soup weather. But mini meatball salad weather? Totally. Ugh, I know. This humidity just will. not. quit. this summer. I gave up yesterday and turned on the AC because I was so tired of everything being damp and sticky! Oh, for sure! You could just omit the meatballs, really, since you’d get plenty of protein from the beans. Or, like you said, use veggie meatballs. 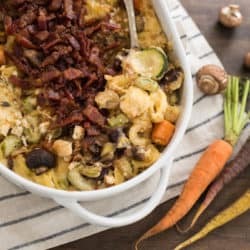 I also love recipes that are easily adapted as vegetarian meals! I am also a huge, huge, huge soup lover – yes, anytime of year soup is on for us 🙂 However your minestrone salad with mini meatballs could just change my pattern 🙂 Perfection! What’s funny is that since I made this salad, I’ve gone back and eaten actual hot soup twice already. I just can’t stay away! Absolutely LOOOOVE this idea! I have a theory that most anything you love- any meal at all can be made into a salad and you TOTALLY did that here!! It sounds like the premise of a cooking show, ala the Sandwich King, where anything can be made into a sandwich. I could be the Salad Queen! haha. BRILLIANT! I have been thinking of an idea on making a video for my blog- this is the perfect premise!! I’m not a big minestrone soup sort of gal but I’m totally digging this salad! love. What a hearty salad counterpart of the soup. Great idea, Lori! Love to try this! Oh you’re clever, so so clever. 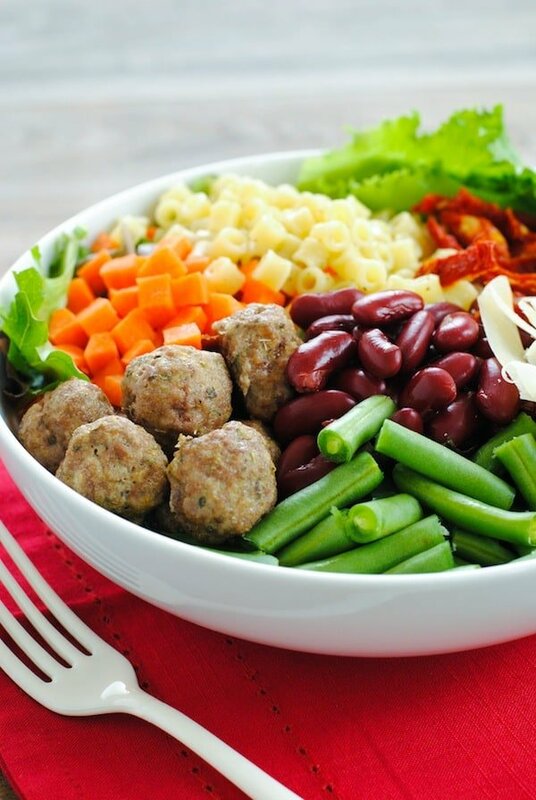 Meatballs in a salad? I’m on this. Yeah, I feel like meatball salads need to happen more often! I’m already thinking of my next one. I love the twist! This salad would be wonderful for lunch right now!! What a fantastic and creative salad. Can’t wait to try this one out next time I’m yearning for minestrone and its over 100 out (which by the way our temps are over 100 for 4 months a year). Ugh, I don’t think I could deal with that type of heat. I would never want to eat soup at that rate!